Owendale (Into Mischief), a maiden winner at third asking at Indiana Downs last September, took a big step forward in two attempts at Fair Grounds this winter, including a win in a salty optional claimer Jan. 17. He was freshened after finishing a disappointing eighth-albeit with a disadvantageous, wide trip-in the GII Risen Star S. Feb. 16. 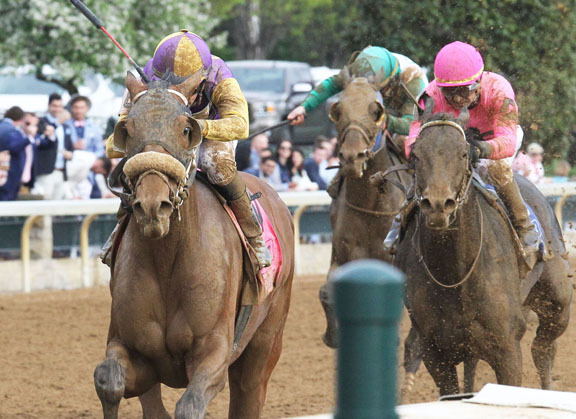 The bay, working bullets in the interim, headed by a five-furlong drill in :59 4/5 (1/31) at Churchill Downs Apr. 6, was overlooked at 12-1 in this second attempt in graded company. With Florent Geroux at the controls for the first time here, he found a spot toward the rear in eighth as the pair of Hawaiian Noises (Super Saver) and Knicks Go (Paynter) showed the way through fractions of :24.33 and :48.23. Owendale began to wind up with a flashy, sweeping move while about four wide as they rounded the far turn, reached even terms with Knicks Go as they straightened for home and kept on rolling down the lane to pull off the upset. Owendale makes it 47 stakes winners for his leading sire, who sends his eighth crop to race this year. The Lexington winner’s unraced dam sold for $25,000 to Korean interests at the 2017 Keeneland November sale and has since produced a 2018 colt by Kantharos in that country. Owendale’s 2-year-old half-brother Yeng Again (Carpe Diem) brought $75,000 at last year’s Keeneland September sale. The extended family has been prolific, as Owendale’s granddam, Zenith, is a graded-placed stakes winner whose produce included GI Lane’s End Breeders’ Futurity winner Great Hunter (Aptitude). Zenith’s half-sister produced champion Stellar Wind (Curlin), a six-time GI winner who brought $6 million as a broodmare prospect in 2017. STONESTREET LEXINGTON S.-GIII, $200,000, Keeneland, 4-13, 3yo, 1 1/16m, 1:44.14, ft.
Holdings LLC (KY); T-Brad H. Cox; J-Florent Geroux. $120,000. Lifetime Record: 8-3-1-1, $187,225. Werk Nick Rating: B+. Click for the eNicks report & 5-cross pedigree. B. C., Ltd.; B-Pursuit of Success LLC (KY); T-Blaine D. Wright. 3–Sueno, 118, c, 3, Atreides–Class Above, by Quiet American. Margins: 1 3/4, 1 1/4, 5. Odds: 12.70, 1.40, 3.90. Also Ran: Knicks Go, Shang, Roiland, Harvey Wallbanger, Zenden, Hawaiian Noises, Chase the Ghost. Click for the Equibase.com chart, the TJCIS.com PPs or the free Equineline.com catalogue-style pedigree. 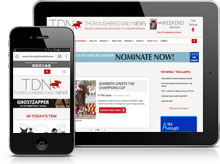 VIDEO, sponsored by Fasig-Tipton.